DUBAI, UAE - 26 April 2012 - The Emirates Group Security Centre of Aviation and Security Studies (CASS) and Edith Cowan University awarded diplomas to 81 graduates, including 18 UAE Nationals undergoing the 3-tier development programme with Emirates Group Security. The graduation ceremony, presided over by His Highness Sheikh Ahmed bin Saeed Al Maktoum, Chairman and Chief Executive, Emirates Airline and Group and Professor Kerry Cox, Vice-Chancellor of Edith Cowan University, awarded diplomas in the Aviation Security Management and Ground Handling. Representing a diverse graduating class which included students from the Emirates Group, private individuals, and staff from two other airlines, 28 nationalities were represented; such as several GCC countries, Brazil, Mexico, Singapore, Myanmar, Kenya, Cameroon, Russia and Austria. The event also showcased 18 UAE Nationals receiving aviation security-related certifications. Five students were also awarded the Aviation Security Professional Management (AVSEC PM) certification; regarded as a prestigious worldwide accreditation by the International Civil Aviation Authority (ICAO). The ceremony was attended by the graduate's families as well as: Australian Ambassador to the UAE and Qatar, HE Pablo Kang; Dr. Abdulla Al Hashimi, Divisional Senior Vice President Group Security; Abdulaziz Al Ali, Executive Vice President Human Resources and other senior Emirates officials. Established to address the growing demand for highly-qualified security professionals, the diploma programmes are part of the Centre of Aviation and Security Studies (CASS), a joint partnership between Emirates Group Security and the Edith Cowan University (ECU) since 2002 Aviation Security and Ground Handling play an integral part in the aviation industry and students from CASS receive training and specialised education which prepares them for a lifelong career in their field. Around half the student body are Emirates Group staff from departments as varied as Cabin Crew, Airport Services, Human Resources and Cargo; allowing these employees to continue working while completing their studies. More information available at: www.emiratesgroupsecurity.com. 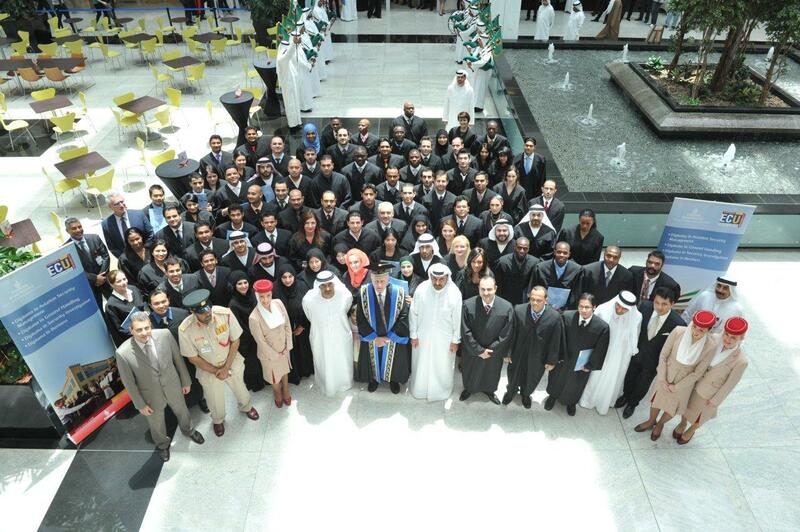 His Highness Sheikh Ahmed bin Saeed Al-Maktoum and Dr. Abdulla Al Hashimi with the 18 Emirati graduates. Australian Ambassador to the UAE and Qatar, HE Pablo Kang, presenting an award for cooperation to His Highness Sheikh Ahmed bin Saeed Al-Maktoum. Kerry Cox, Vice-Chancellor of Edith Cowan University, and Dr. Abdulla Al Hashimi, Divisional Senior Vice President Group Security, to their right.